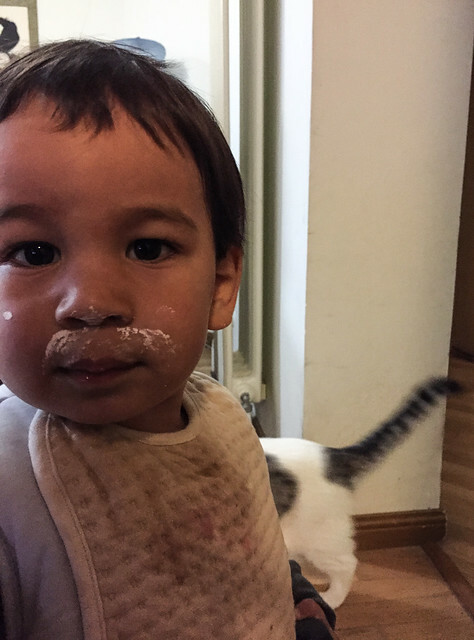 Sporting a “got milk?” mustache (and more). Glad to have Xiao Mao adding the feline photobomb. In Chong Chong’s left had is a Logitech Performance Mouse MX. This is his comfort object, and is with him almost everywhere he goes. It is also there to calm him down when he goes to sleep in his crib… click, click, click, click, goes Chong Chong on his mouse. I somehow broke the mouse awhile back. And, well, he adopted it. I bought the same model again (one of the best mice I’ve ever used). He often works beside me, him with his mouse and me with mine. He does prefer mine, however, since he fairly quickly figured out that his doesn’t move the cursor or cause the occasional sounds. There have been a number of times that I’ve found his mouse on my desk instead of mine.